Are you or someone you know missing out? 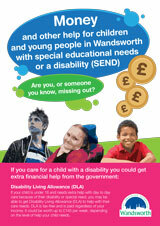 If you care for a child with a disability you could get extra financial help from the government. This new leaflet from the DCR and WAND Team sets out what you may be able to claim and who can help you. This publication was written by Wandsworth's DCR and WAND Team. To request a copy or a several copies for your school, group etc please contact us.